W. W. Norton & Company, 9780393081367, 302pp. What do your colleagues, overlords, underlings, clients, and customers have in common? Not knowing how much they annoy you. Not to mention how much you may be annoying them. The route from cubicle to corner office is strewn with etiquette landmines. And now that the boundaries that once cleanly separated work from personal life are blurred, even polite people don't recognize the difference between professional and social manners. What do you say to a colleague who has just been fired? How do you maintain a family-friendly office without discriminating against singles? What's the difference between showing romantic interest and sexual harassment? Which colleagues should be invited to family weddings? When should you be unavailable, at or away from work? With wit and wisdom, Miss Manners restores civility, guiding you around your coworker's messy cubicle, past your overly prying boss, around the bridal shower for the new temp, and through tedious staff meetings. 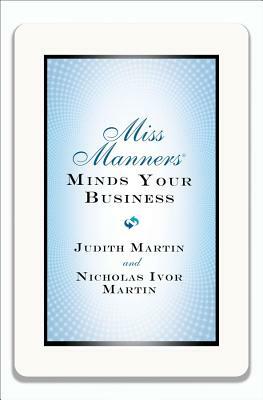 In Miss Manners Minds Your Business, Judith Martin and her son, executive Nicholas Ivor Martin, equip readers with the practical, pertinent, and utterly correct advice necessary to win the job, keep the job, and leave the job with sanity and dignity intact.